First, turning your photography into career takes time, patience and practice, as does everything. It's a highly competitive industry and takes dedication and a strong backbone. Many photographers are self-taught and with the number of online courses and professional workshops, it's easier than ever to hone in on those skills. However, I still think there is a ton of value in getting an old fashion college degree. I know that we all want to have an amazing story that happens overnight but sometimes we aren't so lucky. A degree is timeless and will last through all of your "change of direction" life moments even if the end career isn't what you studied in school. If you are looking for a corporate or "higher-end" job, then getting a degree is definitely the way to go. I recommend minoring in business, marketing, design, or filmmaking- something to give the photography degree a little bit more. Phlearn - My absolute favorite photography and editing course. I recommend signing up for the pro version. You can sign up for a single class or a yearly subscription. I have the yearly subscription which gives me access to all of his courses and lessons. It's an unbelievable low price for so much value! It's important to focus on a specialty and become realllllly good at it. Sure you can explore everything and different types of photography in the beginning but as time goes on, start to think about what makes you the happiest. Fine Art Photographer/Digital Artist- Sell their photographs for a living at art shows, galleries, fairs, and online. Speaking from experience, this can become time-consuming and require up front costs for inventory but can equal life on the road and freedom to make your own schedule. These photographer and artists may also work for commission or create art for magazines, advertisements, movie posters, etc. Travel Photographers - take photos of their travels and can get paid by blogging, posting for travel brands, hotels, airlines, etc. Get started by offering to collaborate with travel companies and brands for free accommodations or airfare in exchange for photos from your journeys. Portrait & Lifestyle Photographers - take photos people. This can include, weddings, corporate, personal, ceremonies, family, senior portraits, head shots, etc. You set your rate, your schedule, and who you want to work with. Commercial, Fashion, Industrial, and Landscape Photographers - take photos of models, products, buildings (indoor and outdoor), landscapes and much more. These photographers are usually self employed (freelance) or an in-house photographer for a business. Sometimes an in-house-photographer may cover all of these areas for their company. Scientific and Research Photographers - take photos to record scientific or medical data. They are usually trained in medicine, biology, or chemistry. Again, these photographers may be freelance or employed by a business. Photojournalists and Event Photographers - photograph current political events, news, local and community events, war, local happenings, political injustice, etc. This type of photography can be one of the most demanding and rewarding fields. It also has the strictest ethical codes and requirements. Downside: Unless you have extra money lying around, most of these photographers have to market themselves and run their business on their own. You must plan for advertising, meetings, appointments, set and adjust your own equipment, purchase supplies, keep records, bill customers, pay bills, and eventually direct your employees. Some photographers also process their own images, and mount and frame finished photographs to sell or hang in galleries. But the upside? You'll be your own BOSS!! If you have self-discipline and motivation, then this is definitely do-able! And SO rewarding. Sell your prints at art fairs or online (Check out Nations Photo Lab for a great place to order prints) - this takes some up front costs and usually an entrance fee for art fairs but it's a great way to get your name out there, make money, and get people buzzing about your work. Sell digital downloads on Etsy - there aren't any upfront costs (other than listing fees) and you can sell an unlimited amount of downloads. Sell t-shirts on Society6 or other paid on demand sites - these sites take a huge percentage so be prepared for that if you decide to sell merch. Become an affiliate for your favorite brands and use your Instagram following to promote equipment, services, or anything for that matter! Once you start making money, I recommend using Freshbooks or 17hats (my personal favorite - it also allows you to create and send contracts, questionnaires, invoices, and more >> get 10% off by using my link) to keep track of your expenses and income. It makes it really easy to file your taxes without any headache or surprises! Inform yourself - Artists start by learning from the masters. Take the time to study some influential photographers - and no, I don't just mean people on Instagram! Learn from the masters and study award winning photos. (This is where art history comes in handy) Also, take the time to learn the industry and know who you are working with and for. Invest in quality equipment - I know that when the funds are low, sometimes you have to make do with what you have but start investing in yourself and your future. It's not about the camera but quality equipment makes it a hell of a lot easier!! Know what you’re talking about - Use this glossary of photographic terms to learn about your craft and to be able to talk about it with professionalism. Give your creativity some space - A skill that we often don't realize we need is the ability to take a step back. When your work becomes dry or your not on your game, take an hour, a day, a week - whatever you need - to step back. Give yourself a break. Your work, clients, employees will all thank you when you come back! Take the time (or hire me) to develop a well-designed website and portfolio space. If you don't have much coding experience and want and easy-to-use, easy-to-create template, I highly recommend Squarespace! It's affordable, and you can sell prints, presets, and services directly on the site. It also keeps track of your analytics and customers. If you know some coding and want full freedom to design your site however you want, then I recommend Wordpress.org with BLUE HOST for super affordable hosting starting at less than $3.95 per month! And of course, GROW YOUR INSTAGRAM! It's one of the fastest and easiest ways to get recognized as a photographer. Growing my Instagram has completely changed my photography business by bringing in new clients and recognition with my work that I wouldn't have otherwise had. I also recommend creating a "hire package" and "client package" (or let me do it for you). The hire package should be sent to potential jobs or clients or if you are looking for representation from an agent, a gallery, or publication write up. It should include a resume, media kit, portfolio, cover letter or artist statement, and a quick email template for fast send out. Just tweak it for each client or brand proposal and hit send! A client package should include, a contract (ALWAYS HAVE A CONTRACT!!! ), a model release (if needed), basic pricing sheet, quick email template, and an invoice. Whatever you want to master in life you need to put the hours in. Take the time to learn photography and practice and enjoy your craft every day. Spend time messing with Lightroom and Photoshop and you'll improve your skills every single day. Don't be afraid to work for free in the beginning. Most of the time, a free job will lead to paid work. Be open to lots of opportunities if they can help you grow as a photographer. I spent countless hours working on set (for free) but as a result, landed some bigger jobs, made tons of great connections, learned more than I ever thought I would, and made lifelong friendships. As I mentioned before, have patience with your craft and know when to take a break. You can hustle hard every day but accept your failures and have patience with yourself and the journey to becoming a paid photographer - because sometimes that can be just as fun! 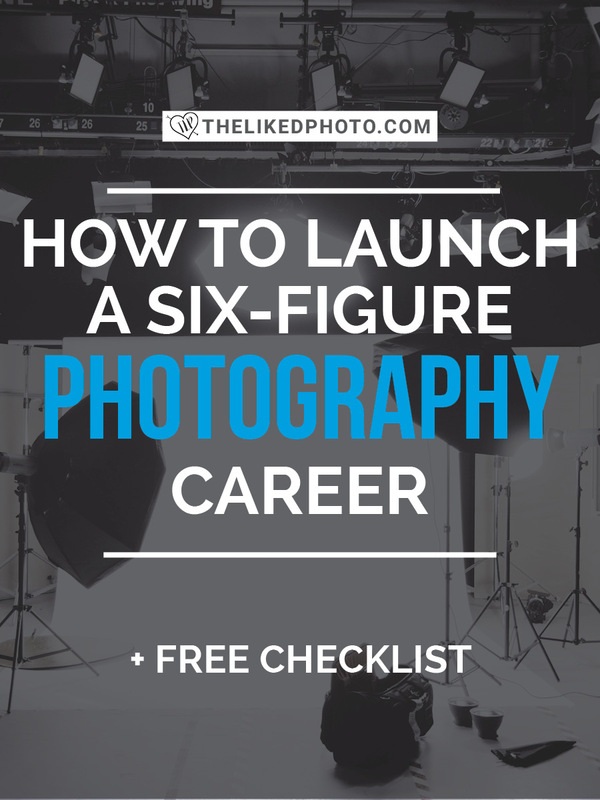 Are you in the beginning stages of becoming a full-time photographer? Are you currently a full-time photographer? Share your journey and stories in the comments below!